The holiday lights seem to be shining brighter in Petaluma this year. During our evening driving tours we have seen more houses with lights and more lights on individual houses than we can remember in recent years. I don’t know whether that is a sign of our economy getting better or just people getting tired of not living their lives because of the times; either way it is a wonderful sight. We made our first tour of the lights two weeks ago, with our son bundled up in the backseat and a thermos of cocoa along for the ride. In our rush to get out the door I didn’t close the thermos tightly and ended up sitting in a puddle of cocoa most of the way but that didn’t even put a damper on our enjoyment. 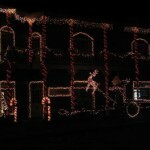 Since then we have noticed a steady increase in decorated homes and buildings each time we go out for a drive. Whether it is just a string of lights across the porch or a brilliant Griswold-esque spectacle, each is its own labor of holiday love. Living on the west side we tend to make more rounds in our own neighborhood but you can’t go the season without driving to see Claret Court on the northeast side of town. Year after year this cul-de-sac (minus one house) wows us with their dazzling lights and holiday displays. Once house in particular (at number 917) is a true explosion of holiday cheer. It boasts a mind boggling number of lights, a lawn packed with handmade figures, a garage filled with a holiday village and working train, and a snowman sprinkling snow over the driveway. 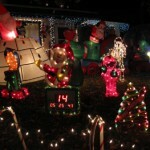 The owner started putting up the lights after Halloween and began the rest after Thanksgiving. 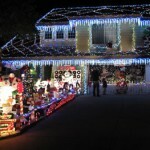 That is some incredibly dedicated holiday spirit, not to mention a fairly significant investment in decorations and power. He has converted to LED lights so his monthly power bill is now about $400 (down from about $1300)! The official City of Lights Driving Tour map can be downloaded from the Petaluma Visitors Center website here. The homes and businesses featured on this map are in competition for the best holiday light display. You’ll find 917 Claret Court on the list, as well as some other spectacular houses and businesses. We were pretty impressed with the Creamery on Washington and the house at 1728 Capella Court but we still haven’t managed to see them all (yet!). After viewing all of the contestants you can go back to the website and vote for your favorites. The latest issue of Petaluma Post also has a list of decorated houses. This is Christmas weekend and while many people leave their lights up until New Year’s some will start to come down next week. Make sure you don’t miss the chance to get out and enjoy these brilliant displays of twinkling holiday cheer. 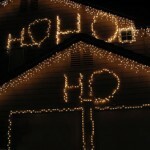 Thank you to all of the enthusiastic holiday light decorators this season! You make the season brighter for everyone.